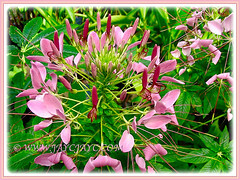 They were seen growing wildly with white and pink inflorescences at Cameron Highland in Malaysia when we holidayed there in the year 2008 . Our first sight of them and we saw them again in August, 2011 with only pink flowers. We have never planted Cleome hassleriana before, but praise and thank the Almighty God that we get to see them whenever we browse through our photo albums. 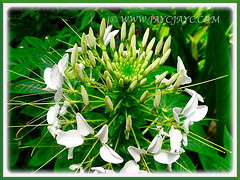 Botanical Name: Cleome hassleriana (syn. : Cleome arborea/spinosa/houtteana, Tarenaya hassleriana). Common Names: Spider Flower, Spiderplant, Pink Queen, Grandfather’s Wiskers. Origin: Native to southern South America in Argentina, Paraguay, Uruguay and southeast Brazil. It is also widely cultivated. Plant type: An ornamental, evergreen and perennial in tropical climate but a half-hardy annual in subtropical and temperate climes. 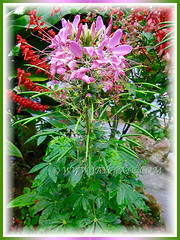 Features: Cleome hassleriana is a captivating species of the genus, Cleome that consists of about 170 species of flowering shrubs. It is an evergreen perennial in tropical climate and grows moderately to between 0.5 to 1 metre in height. 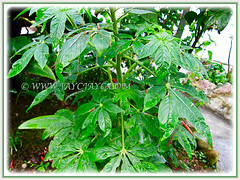 Leaves are spirally arranged, palmately compound, with five or seven leaflets. The green leaflets are up to 12 cm long and 4 cm broad. The leaf petiole up to 15 cm in length. The blossoms got the nickname ‘spider flower’ because of their sharp and unique flower clusters. The inflorencenses can be purple, pink, or white in colour, with four petals and six long stamens. Eventually it produces a fruit capsule up to 15 cm long and 3 mm broad, containing numerous explosive seeds, causing the plant to be somewhat invasive. 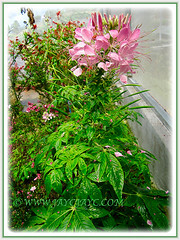 Culture (Care): Cleome hassleriana can be easily grown with the right conditions. Light: Best in full sunlight. Soil: Humus-enriched, loamy and well-drained soils. It enjoys moist soil too. Others: Prune the plant to encourage bushiness and increase flowering. Spray the plant regularly to keep its leaves dust-free. Feed once monthly with a balanced liquid fertiliser for flowering plants. To keep plant tidy, prune off brown or withered leaves and spent flower heads. Generally free from serious pests and diseases. For subtropical and temperate regions: Hardiness: USDA Zone 7a onwards. 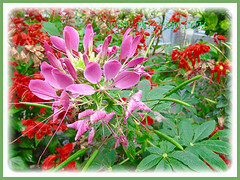 Cleome hassleriana is usually cultivated in subtropical and temperate regions as a half-hardy annual. Flowering lasts from late spring to early fall. Feed the plants with a water soluble fertiliser that can be given monthly from spring to summer. Water and feed sparingly in winter but water well during summer. Propagation: By seeds. It will self-sow too from its explosive seeds. 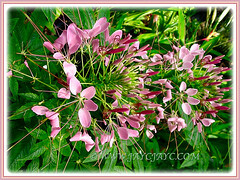 Usage: The Cleome hassleriana are stunning plants with captivating flowers that are pink, white or purple in colour. In warm climate condition, this captivating plant will be ideal in a tropical themed garden. It can be planted on the ground or as a container plant, located indoors as a houseplant, and outdoors in the garden, porch, deck or patio. Excellent too, when placed amongst a crowd of other flowering plants of varied colours. 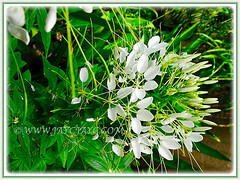 Thanks to your website I was able to identify a most beautiful flower I saw on a trip to Bekok, Johor, yesterday: Cleome hassleriana. Much appreciated. You’re most welcome, Poh Lin. We’re delighted that you were able to nail the beautiful plant’s ID.